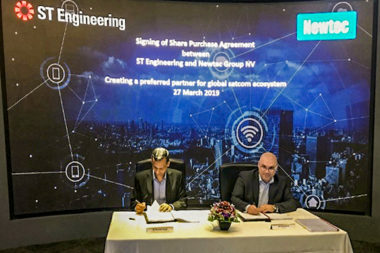 ST Engineering said the purchase will help it meet future drivers of connectivity, notably in areas “where 5G and satcom converge.” Photo shows Ravinder Singh, president of ST Engineering's electronics division (left), and Roald Borré, chairman of Newtec's board of directors. Credit: Newtec. ST Engineering said the purchase will help it meet future drivers of connectivity, notably in areas “where 5G and satcom converge.” Photo shows Ravinder Singh, president of ST Engineering’s electronics division (left), and Roald Borré, chairman of Newtec’s board of directors. Credit: Newtec. SpaceNews Senior Staff Writer Jeff Foust contributed to this newsletter.